Hearthstone’s much-anticipated Knights of the Frozen Throne expansion is out today, and if you’re one of the folks drooling over the thought of opening your fresh new packs, I’ve got some good news and quick tips for you. First off, now that Hearthstone’s pack changes are in full effect, there are a few new ways to “game” the system, as it were, to increase or decrease your odds of opening certain cards. According to the new changes, you will no longer receive duplicates of Legendary cards you already own. On top of that, you’re guaranteed to get a Legendary within the first ten packs of this set that you open. Finally, this expansion launches with a single-player “Adventure” mode that’s free to play, and rewards you with a free Death Knight Legendary card (1 of 9 available) once you beat it. What that all means is this: if you want to increase your odds of getting a Death Knight—which I imagine a lot of you do since that’s kinda the theme of this expansion—you should open the packs first, because there will be more Death Knight cards available in your collectible Legendary pool. It works the opposite way, too: if you want to raise your chances of getting a non-Death Knight (The Lich King and Arfus look particularly appealing), you should wait to open packs until after you get your free Adventure Legendary. Since I’m particularly keen on the Death Knight cards, which offer some fantastic-looking late game control options for nearly every class and almost all look to be quality cards, I decided to open my packs before going into the Adventure. Having opened around 60 packs so far, I have to say that the pack changes are making a massive difference in the experience of bulk-opening cards on expansion launch day. 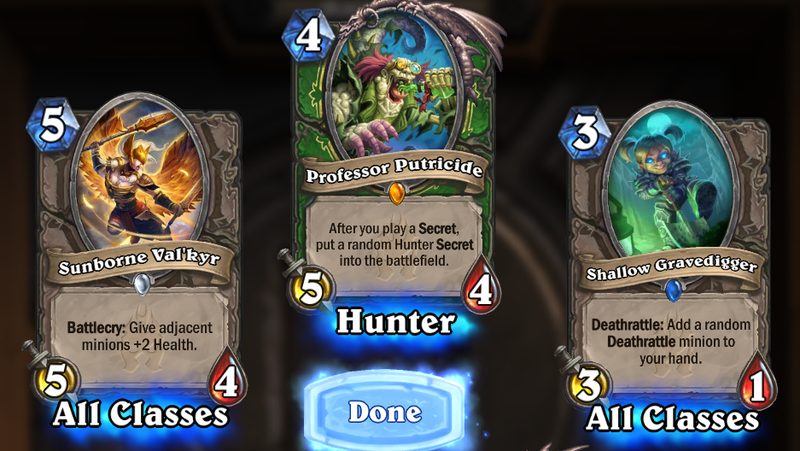 Already, I’ve opened two Death Knight cards, and knowing that the next Legendary I get won’t be a duplicate goes a long way toward decreasing the sense of dread that sometimes comes with opening new packs. Since you can no longer get more copies of a card in a new pack than you can fit in a deck (e.g., you can no longer open a pack with four Angry Chickens in it), there seems to be more variety in what’s available to open. On a smaller scale, these changes might not seem like much, but they amount to a vastly improve card opening experience when you’re setting aside time to open a huge batch of new cards. Best of luck - I can only hope everyone gets as lucky I did with this launch.